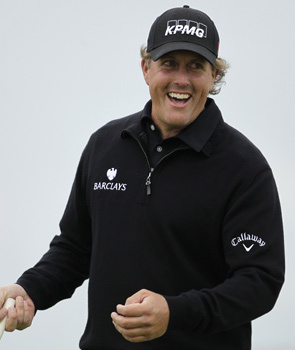 Will Mickelson be all smiles on Sunday? Can Americans reverse their recent slide? The love affair between American golfers and the Open Championship, the oldest and grandest of the four golf Majors, would appear to be going through a trial separation. Winning the revered Claret Jug had almost become a birthright for the leading US golfers of each generation. The first 60 years of Open history passed without an American winner – a sequence that Jock Hutchison brought to an end at St Andrews in 1921. The Twenties saw Americans dominate the championship for the first time, the amateur Bobby Jones and Walter Hagen winning seven of the next nine titles between them. After Jones’ third and final victory in 1930, there were just two American winners in the next 30 years: Sam Snead in 1946 and the legendary Ben Hogan, who won on his only appearance at Carnoustie in 1953, although it should be noted that in the late-Fifties, when Peter Thomson, the Australian, won four of his five Opens in a five-year period from 1954 to 1958, many of the leading Americans sidestepped the Open because they felt the prize-money was not attractive enough. But since the first of Arnold Palmer’s two wins, in 1961, Americans have won 28 of the past 50 Opens, with Jack Nicklaus (three), Tom Watson (five) and Tiger Woods (three) leading the way. Even many of the one-off winners have been Americans, with Tom Weiskopf, Bill Rogers, Mark Calcavecchia, Tom Lehman, Ben Curtis, Todd Hamilton, David Duval and Stewart Cink all claiming their only Major successes on these shores. The late great Seve Ballesteros cut a swathe through the field on three unforgettable occasions before golf’s automaton Nick Faldo ground down the field to take his three Opens, but the Stars and Stripes were raised more often than not. In past years, pre-Open press conferences have been dominated by Americans proclaiming their undying love for the dark arts of links golf. “This is how golf should be played,” has been the mantra, with bump and runs, low chasers and 200ft undulating putts, the likes of which are never seen on the target golf courses across the Atlantic, are talked of as sacrosanct. Now, instead of being quizzed on the nuances of links golf, our American friends are being bombarded about the apparent terminal decline facing golf in the States. Where does the blame lie? The British press love to assign blame, they are experts in the game. Is the growing disparity down to youth programmes, a more lenient approach to club membership, the game’s administration in America? No-one is quite clear yet. Phil Mickelson, the most recent American Major winner at the 2010 Masters, accentuated the positive on the tilt in golf’s balance of power. “I’m not worried about American golf,” he told the world’s press in Kent on Tuesday. Maybe it’s down to a lack of proper preparation? For the first time in years the pre-Open tune-up, the Scottish Open was played on a links course. Castle Stuart was a genuine taster of what the world’s leading players will face when the big one starts at Royal St George’s, Sandwich on Thursday. The driving rain, buffeting winds, pot bunker-laden fairways, and an array of shots that asks every question of the professional’s choice of 14 clubs in his bag were the challenges faced last week in Inverness. Yet only eight Americans showed, with Matt Kuchar’s joint tenth the best showing. Some, like Nick Watney, have a genuine Open pedigree in recent years, the two-time PGA Tour winner this season improving year on year with his seventh place last time out at St Andrews suggesting he could buck the trend. Ahead of the stiff links test, he said: “I really enjoy the different style to the game we see in America. I’m a low ball-hitter so I’d like to think that it suits my game. I love the fact you have so many options on different shots. “I think if the wind blows like this, and they keep the tees back, you could see some extremely high scores. I hit some shots in practice that I thought were good but ended up in a bunker or in the rough. With one Watson, Bubba, threatening to win a Major in the not too distant future, it was left to another Watson to highlight the unpredictability of this venerable championship that nearly saw him crowned champion again two years ago. You could have heard the sympathetic groans all the way across the Atlantic when Tom was pipped to the post by compatriot Cink, but the 61-year-old told Reuters he sees no reason why a senior golfer could not feature again come Sandwich Sunday. “I don’t see why it’s not feasible for a 50-something to win this week. Links courses are great equalisers. You don’t have to pound the ball or hit the ball particularly long although they have added length to many of the holes here,” Watson said. Yet an American lifting the revered trophy on Sunday evening as dusk falls on Kent would still be a genuine surprise. And then there is Rory. If the absence of Woods from the world’s oldest Major was not a big enough blow to the lustre of the American challenge, then the impact of the 22-year-old US Open champion from Northern Ireland puts the fortunes of US and European golf into even sharper relief. McIlroy’s game is a joy from start to finish, from his engaging manner off the course to the unrestrained, natural beauty of his swing. A breath of fresh air. As Woods’ slide from perennial Major winner to increasingly sidelined also-ran, McIlroy has come to fill the void and the smile is back on golf’s face. It’s easy to forget we could be talking about McIlroy defending his title in Kent this week if he hadn’t come off second best against the murderous conditions on the second day last year and shot an 80. For McIlroy, the American lull is just one of those things. “American golf isn’t as bad as everyone is making it out to be,” McIlroy told the press on Tuesday. Not since Woods in his pomp, or even in the nadir of his controversies, has a press room been so packed, waiting on every word from the endearing 22-year-old. Likewise Luke Donald, the world No 1 bidding to become the first English winner of the Open since Faldo in 1992, thinks it’s just one of those things. One thing is for sure, the likes of Donald and Lee Westwood will be hoping that Sunday doesn’t see the start of a glorious reconciliation between the US and golf’s four holy grails with their Major cabinet picking up dust with every passing year. The Europeans’ dexterity around the greens is significantly superior to that of their American contemporaries. The likes of Donald, McDowell, Kaymer and a host of Scandinavians possess Houdini-like ability to salvage par when a bogey seems inevitable. They benefit from combining USPGA with European events, whereas the Americans’ fondness for pristine layouts and reluctance to cross the Pacific comes back to haunt them every July. The United States has no tennis players that are world class since the end of Sampras, Courier and Aggasi. When Woods, Mickelson and Furyk are past it in 3 or 4 years time they will not compete with Europe and South African golfers in the word”s top 10. The PGA tour has too many events on easy courses. Only the US Open is a monster test and Ulster owns that now! A European will win this week and I doubt any American will finish top 5 other than maybe Cink who understands the Open. Good article now let’s enjoy BBC and the Open.